Transform Your Home with Woodbury Shutters by Creative Window Coverings! Creative Window Coverings, Inc. only work with the best brands, and we have got massive variety in all our window treatments and coverings. One of the leading names when it comes to shutters is Woodbury®, which uses advanced manufacturing methods, and the best wood to create their shutters. The inspired designs of the shutters, and superior finishing and durability means that you can never go wrong with Woodbury® shutters. They are formulated for strength involving advanced thermoplastic material that is resilient and durable. All composite wood used in making Woodlore Shutters is harvested from managed forests and come with polypropylene coating, which allows easier stain removal and moisture absorption. These shutters are of the highest quality, since they come with reinforced engineered stiles with complete bonding and solid support for shutter panels. You don’t have to worry about any sun damage in your home, since the shutters come with UV inhibitors that keep out UV rays and prevent color fading. You don’t have to worry about matching the shutters with your home, since there are lots of designs in Woodbury shutters that will match your home décor. The extensive range of options in shutters ensure that you will find different stile options for every window size. You can easily install and assemble the shutters, since they come with pre-installed magnets and hinges, pre-mitered frames, and slotted keyholes. Make your Woodbury shutters standout by personalizing them in any way. 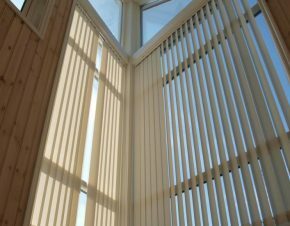 You can choose to get different fixed louvers, hidden or offset tilt rods, café styles, or corner and bay window shutters.